Much like the saying one person’s trash is another person’s treasure, Roberta Masciarelli’s art pieces involve recycling. 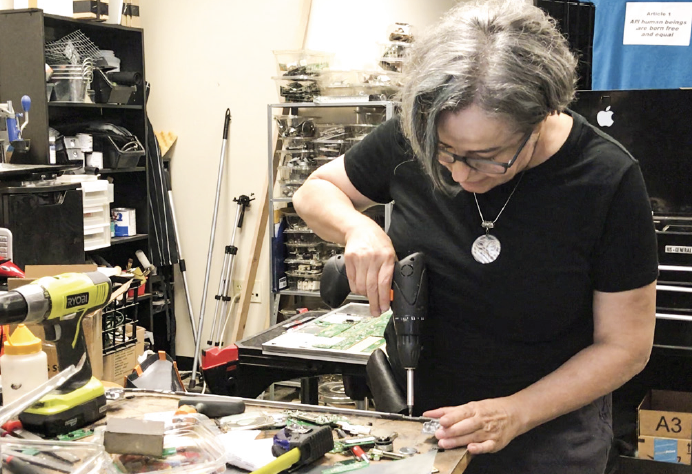 Many of her pieces involve plastic and metal found in a variety of older computer technology. A solo show of her artwork is taking place in the Brazos Gallery through Nov. 10. Masciarelli’s artwork carries a special message. "I am very concerned about the environment; very concerned about everything we are polluting and I try, in some way, to pass this message on to everybody," Masciarelli said. "Slow down a little bit in your desire for technology because where we are going is not good at all," she added. Masciarelli used to visit Goodwill stores to get parts and electronics to make her art. Now, people are bringing parts to her, including computers, keyboards, printers and monitors. She believes old technology is the worst waste we can put in landfills. Visual artist Roberta Masciarelli uses recycled materials to create her sculptures. "Everything is on the curb. What can I do? Sixty percent of printers are made by plastics, sometimes not recyclable." Masciarelli adds,"Technology is good, but the way that we are going is unbalanced. I believe that we have something to think about before you buy your new iPhone if you really need a new iPhone." Charles Coldewey, interim coordinator for Brazos Gallery, has seen her work. "I like the story it's telling quite a bit. It really inspires students' imaginations because she's physically going out and looking for objects," Coldewey said. "She likes the idea of showing you what's underneath, showing you how things are constructed. She really likes the truth of materials, which is leaving them as they are and not covering them up, hiding them," he added. "FireFighter" is an assemblage sculpture, 95 percent of which is from recycled products. Masciarelli's art career dates back to when she was living in her native Brazil. She earned her bachelor's degree in architecture from Mackenzie University in Sao Paulo. At that time she worked in computer graphics. "I was an illustrator, graphic designer, art director, web designer. Then 10 years ago, I got enough work with computers. Then I started working with my hands," Masciarelli said. She has been a full-time artist for 10 years and has had national exhibits in Dallas, Washington DC, Santa Fe, Sedona, and New York. She has also exhibited in England, Holland, Denmark, Portugal, Spain, Turkey, South Africa, New Zealand, Bosnia, Japan, Italy, and India. She is currently working out of her studio in Addison. Gallery hours for Masciarelli's solo show are from 10 a.m. to 4 p.m. She will also attend a reception and greet visitors Oct. 19 from noon until 1 p.m.